This free printable list of heavy work activities for home will make planning your child's sensory diet so easy! Who knew household chores could be so beneficial? 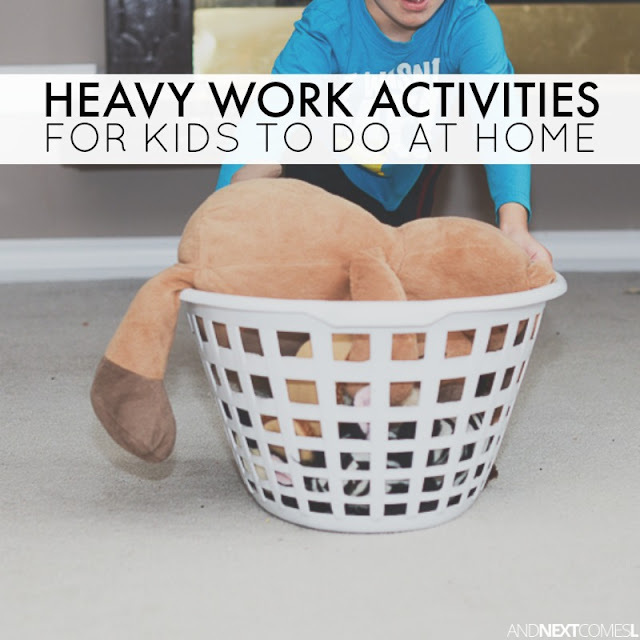 It's no secret that heavy work activities are beneficial for kids, especially those with sensory issues or autism. You certainly don't have to get creative when it comes to finding heavy work activities for kids because most household chores work perfectly. So if you are looking for some heavy work activities for kids to do at home, then look no further than this list of 30 simple ideas. Chores are good for kids, right? You bet! They are one of the easiest heavy work activities that you likely already incorporate into your day. But, in case you need a little more inspiration, here are 30 heavy work activities that kids can do right at home. Do outdoor chores: mow the grass, shovel snow, rake the leaves, etc. Do indoor chores: vacuum, sweep, mop, etc. Make or build something using real tools like a hammer, sander, screwdriver, etc. Happy to hear that, Staci!